There is something for everyone in Quezon: colorful fiestas, great food, a rich history, and beautiful ancestral homes. 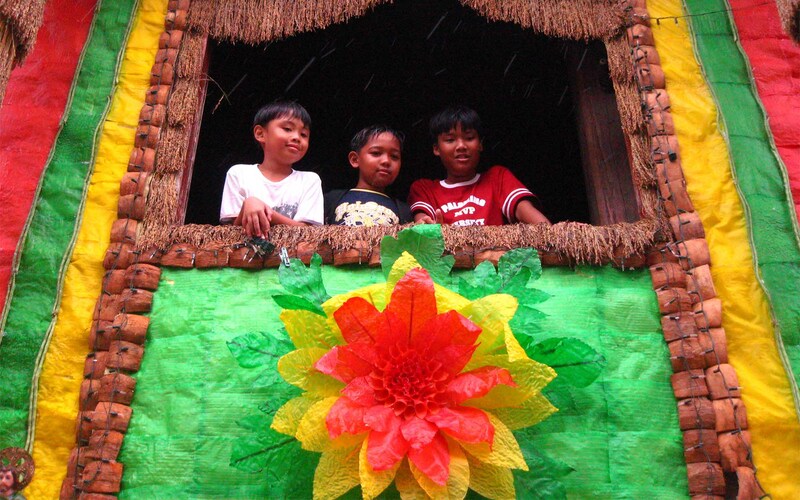 In Quezon, the merry month of May is the vibrant blossom of the sultry summer season. It takes nearly three hours for provincial buses to finally shake loose from Cubao to reach the Lucena Grand Central Terminal. Here, jeepneys await visitors to take them to Lucban, the first stop of our Quezon province journey. A trip to the three towns of Lucban, Tayabas, and Sariaya could be completed on a full-day tour. Although it is still best to book an overnight stay in Lucban, for when the sun sets, the entire landscape glows bright red as Mount Banahaw and its terraced rice paddies peek out from the side of the road. 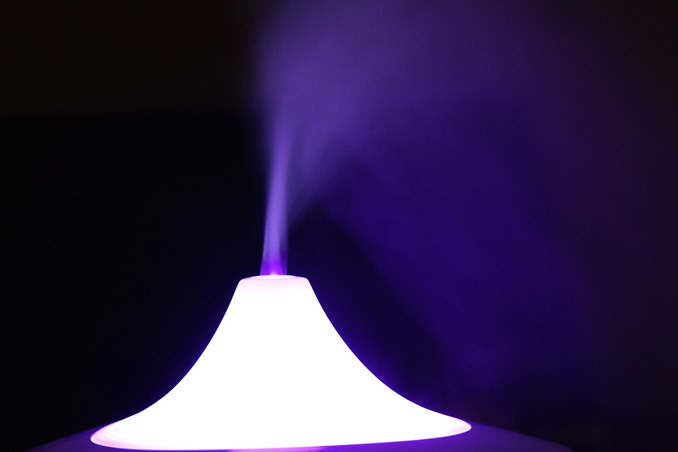 At dusk, the temperature dips and the clouds from the nearby mystical mountain roll down, blanketing the provincial landscape with its translucent white mists. By May 15th, which is the Pahiyas Festival, sleepy Lucban wakes up to a burst of colors where every house is decked with summer fruits, vegetables, root crops, and its famous longganisa. 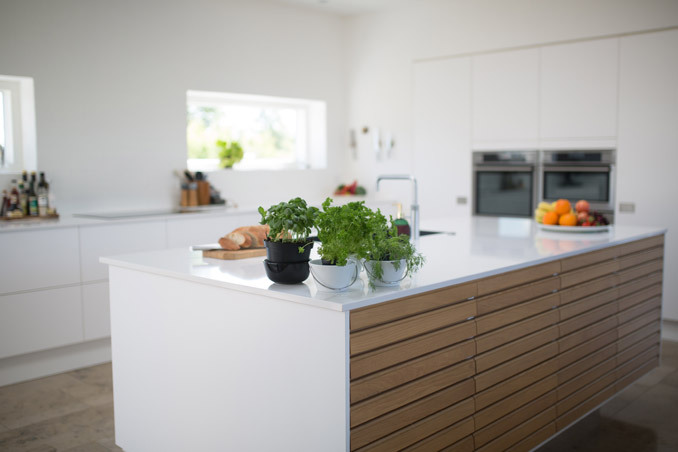 The leitmotif is the kiping, a translucent rice wafer shaped into a leaf and tinted in brilliant tropical colors. The sheets of kiping are strung together to form petals of huge flowers or chandeliers called arangya. 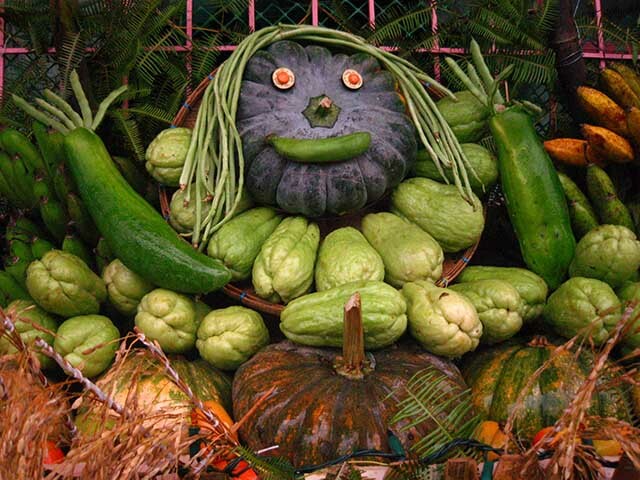 This unique display of edible folk art is to celebrate the Pahiyas, a yearly thanksgiving to the patron saint of farmers San Isidro Labrador. Lucban is a leisurely walk by the old landmarks at the town proper, which is composed of a 400-year-old church, an ancient Catholic cemetery, and an American-era monument to Jose Rizal that almost made it to Luneta Park. 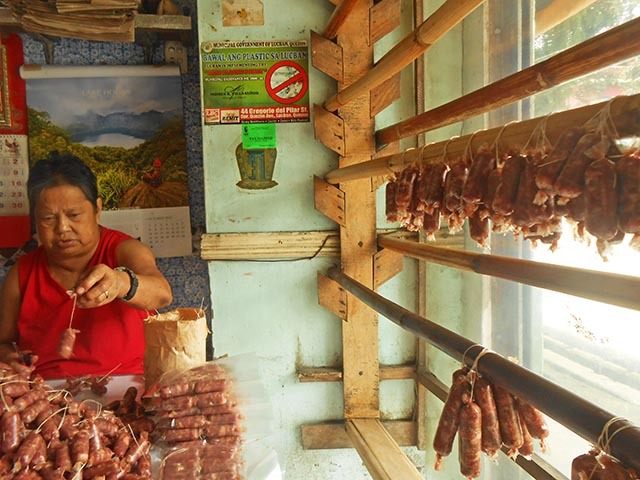 Surrounding it are ancestral houses that still have its sliding capiz windows, stores that make Lucban longganisa, and random stalls that serve pancit habhab. 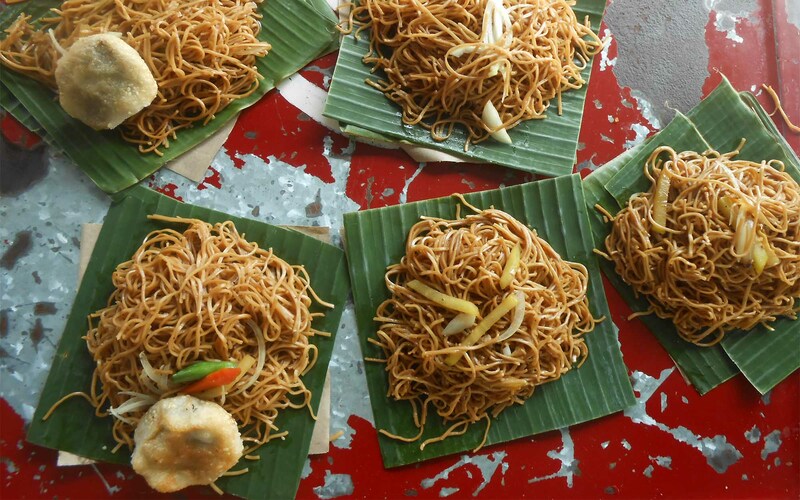 The traditional way of eating the pancit habhab is to slurp the silky noodles from a banana leaf nestled in your palm. The cozy Old Center Panciteria has been in business since 1937, and it claims to be the home of the original pancit habhab. The restaurant has a gallery of sepia photos showing the same town landmarks, only from an earlier era. About five kilometers from San Luis is Samkara Restaurant and Garden Resort, which is set under towering coconut trees connected above by an intricate network of bamboo catwalks used to harvest the potent lambanog drink. 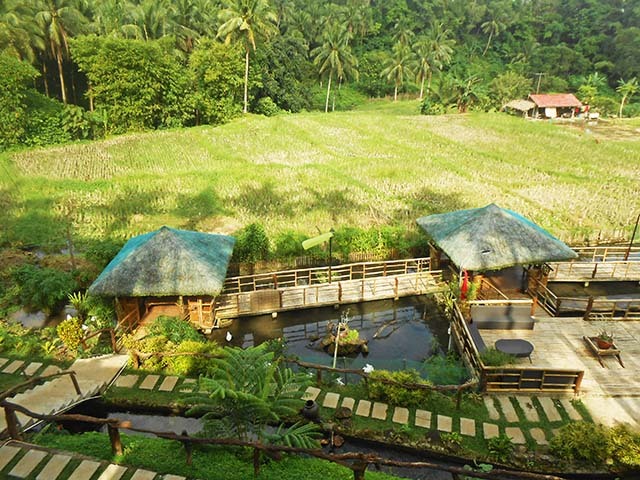 The resort is snuggled between the foothills of mystical Mount Banahaw and the rustic provincial landscape of Lucban. The first rain of May sets the perfect morning mood for breakfast in this mountain resort with its unlimited kapeng barako and a delicious spread of Lucban longganisa, daing na biya, and the freshest fruits from the town. 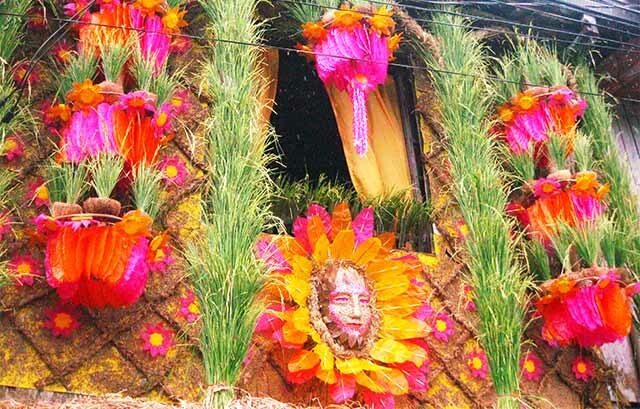 Lucban’s Pahiyas remains unrivalled, but thanksgiving fiestas are also simultaneously celebrated in the neighboring towns of Tayabas and Sariaya. From Lucban, take a jeepney going to Lucena, and then get off at Tayabas Basilica. From 1749 to 1946, the whole of Quezon province was known as Tayabas. In 1946, President Manuel Roxas renamed the province from Tayabas to Quezon in honor of the late Commonwealth President Manuel L. Quezon. Central to Tayabas folk history is Apolonio dela Cruz, popularly known as Hermano Pule. In 1832, he founded the Cofradia de San Jose, a brotherhood of laymen that grew to thousands and made Tayabas its headquarters. The colonial authorities found their practices to be heretical and subversive. After a series of manhunts, dela Cruz faced a summary trial in 1842 and was executed by firing squad at the Casa Tribunal de Tayabas. 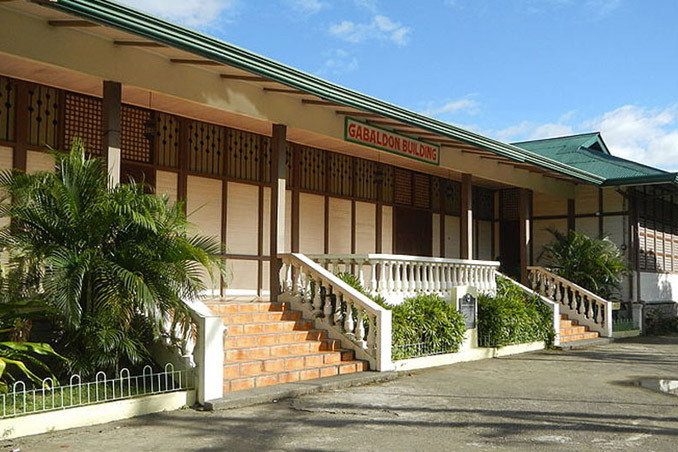 For insights into the rich history of Quezon Province visit the Casa Comunidad de Tayabas that now houses a museum and municipal library. 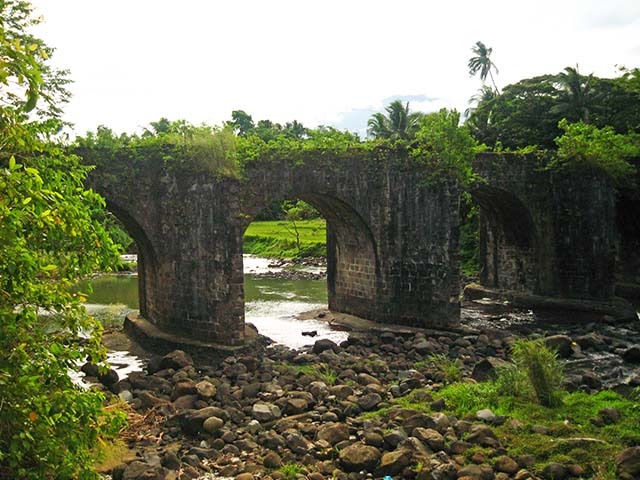 Another area of historic interest is the Malagonlong Bridge that once held the title of being the longest stone bridge built by Spain in the country. This arched bridge was built through forced labor between the years of 1840 and 1850 under the direction of the Fray Antonio Mateos using 100,000 adobe blocks fused together with molasses. 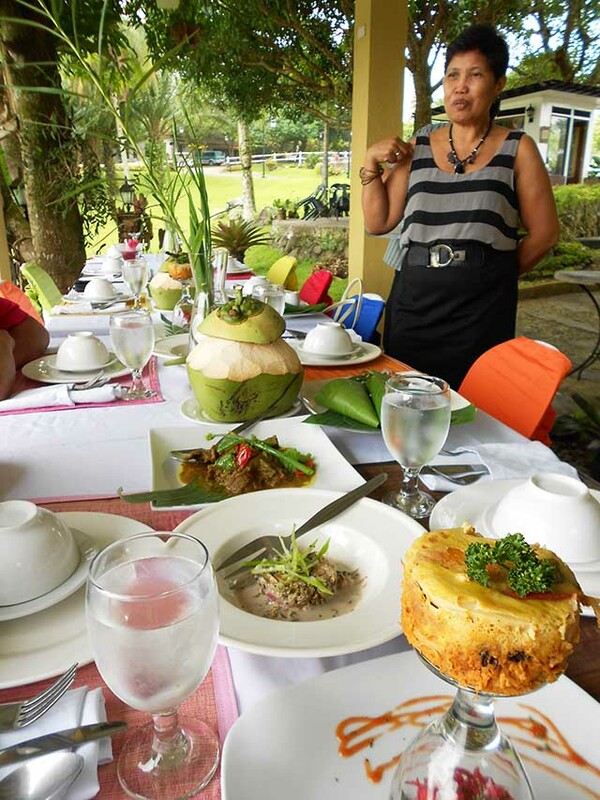 In a province where the coconut is king, it is not surprising for locals to find ways of incorporating all parts of the tree into the preparation of their food. 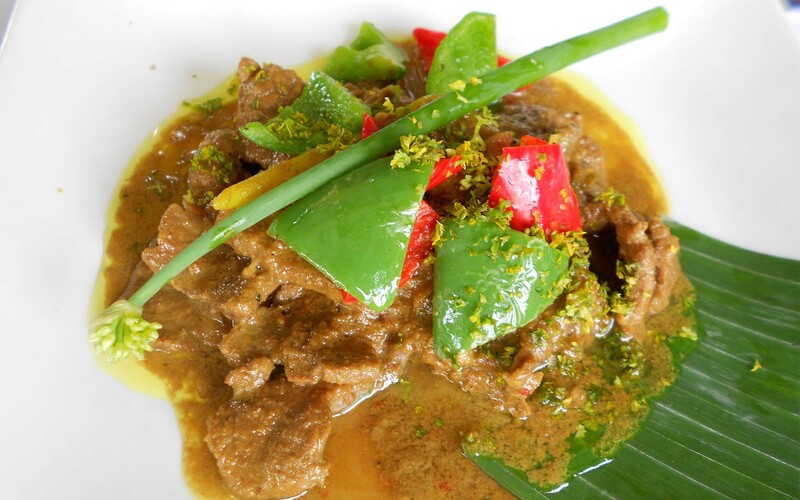 Local food guide Tina Decal is known for introducing the Tagayan Ritual with lambanog through Kulinarya Tagala tours. Lambanog is coconut sap liqueur that resembles the taste of the finely aged scotch. At Graceland Estates and Country Club, resident chef Jio Macapilay whips up a dish of kulawo, which is banana heart and burnt coconut meat that melts in the mouth. The adobong baka sa gata and sinigang na hipon sa mura taste heavenly when paired with steaming rice wrapped in banana leaf. For dessert, Chef Jio adds essence of lambanog to chocolate balls. Take another jeepney ride from Tayabas heading to the most charming town in Quezon, Sariaya. 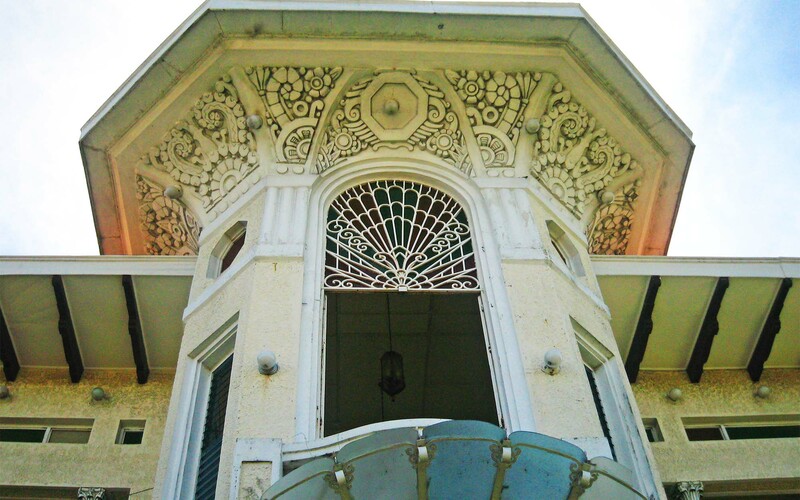 The main landmark of this town is the most imposing—a twin-spired, brick-roofed mansion along Maharlika Highway. 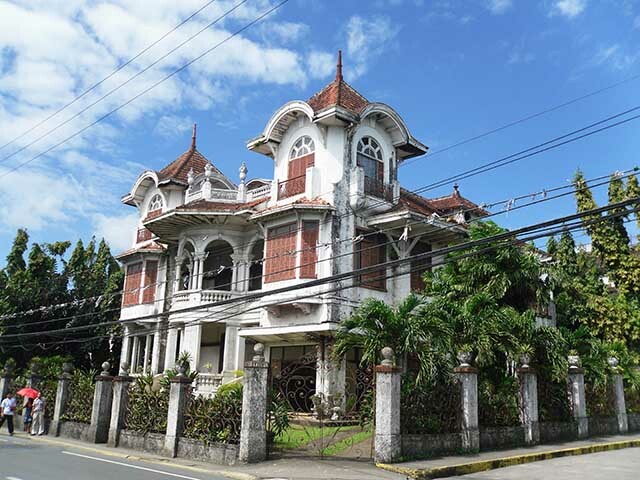 The Governor Natalio Enriquez mansion (below) was designed in 1931 by Andres Luna de San Pedro, the son of the celebrated painter Juan Luna. 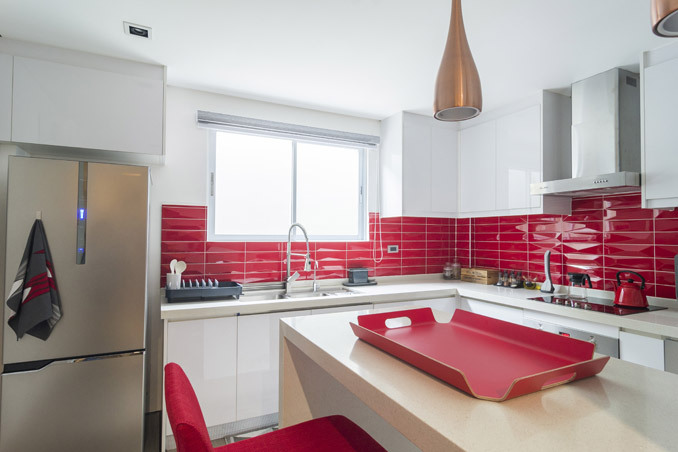 The interior is furnished with pieces from both the Art Nouveau and Art Deco eras, all designed by the architect. 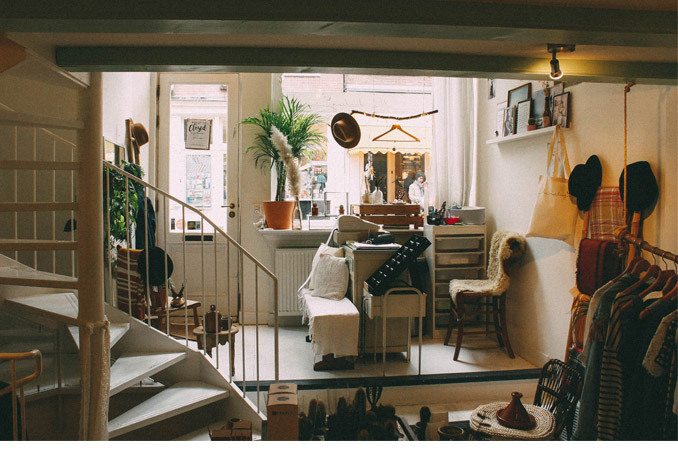 Walk the inner streets around the town plaza to discover even more architectural gems. Eric Dedace, a local historian and tour guide, explains that the imposing architecture in Sariaya is attributed to the wealth brought by the coconut boom in the early 1900s. During World War I, the Philippines ranked fourth as the world’s supplier of copra. 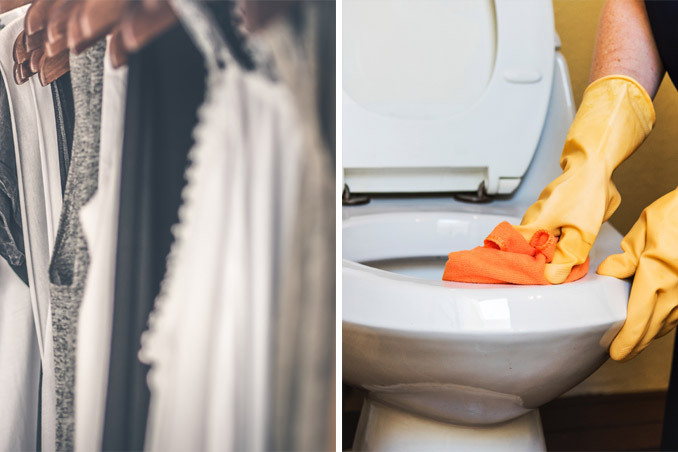 This was because coconut oil was in demand for its high glycerin content, which is an essential ingredient for manufacturing explosives. 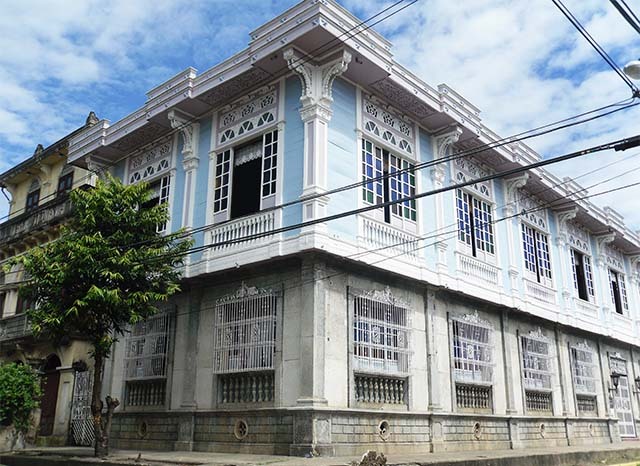 Juan Arellano designed Sariaya’s old municipio (municipal hall) in 1931. The structure has a central towering projection topped by a drum lantern. All sides are flanked with busts of Grecian women. Its stepped ziggurat-style façade, along with decorative zigzag and wave-like moldings are typical Art Deco details, while the banana leaf motifs give the structure a local flavor. 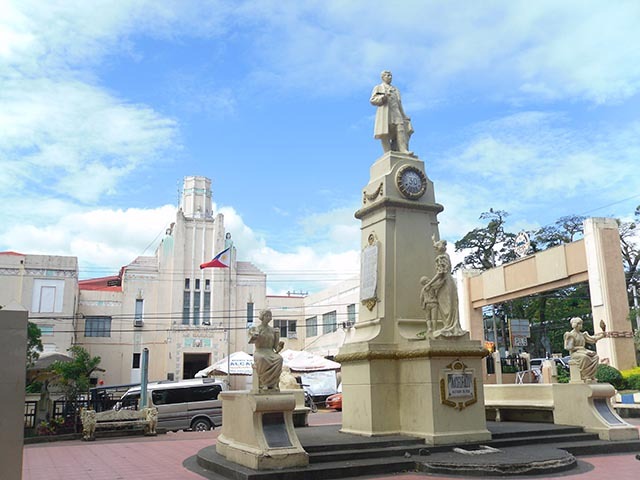 Right in front of the municipio is a Beaux-Arts monument to Jose Rizal that was unveiled in 1924. Also built around that same time with the Rizal Monument was the glorita or bandstand. 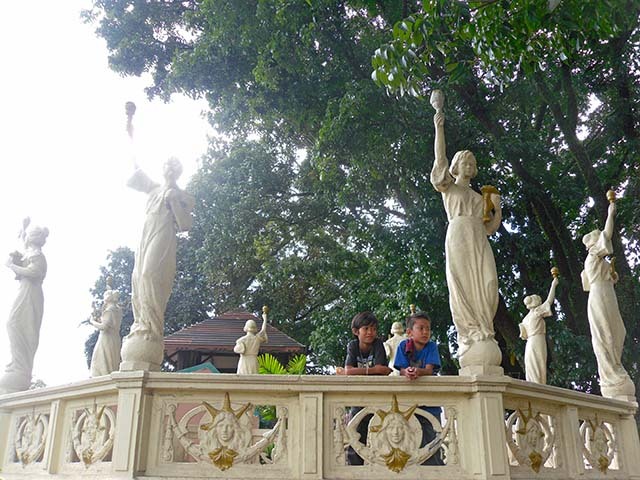 The bandstand has eight Grecian maidens dressed in Filipiniana outfits. Each statue holds a torch, bringing to mind the Statue of Liberty. 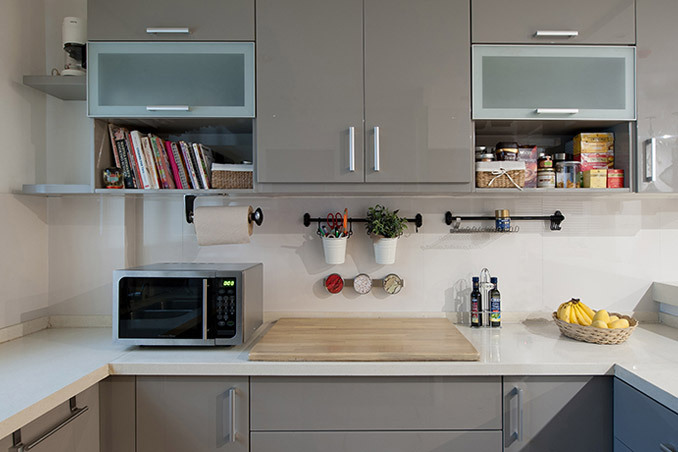 Flame-shaped glass bulbs fitted with electrical wirings top these torches. Nearby is the Art Deco-ornamented Gala-Rodriguez Mansion (above). The house of Dr. Isidro Rodriguez was his gift to his ailing wife Doña Gregoria Gala. 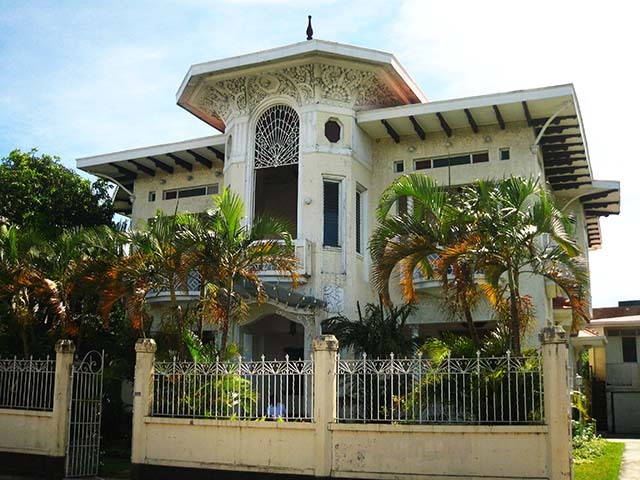 Architect Juan Nakpil designed it in 1935, and its French Provencal furniture was ordered from Don Gonzalo Puyat in the 1940s. 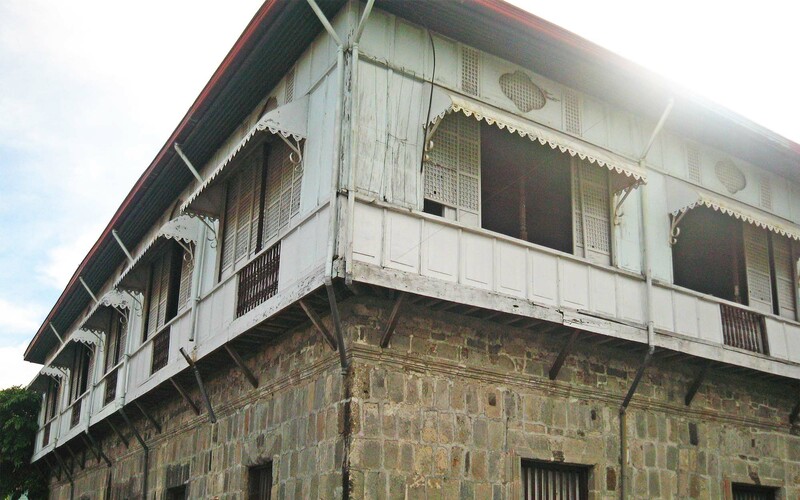 The oldest home in this cluster of antique houses is the Catalino and Luisa Rodriguez Ancestral House that was given a sobriquet at Villa Sariaya. 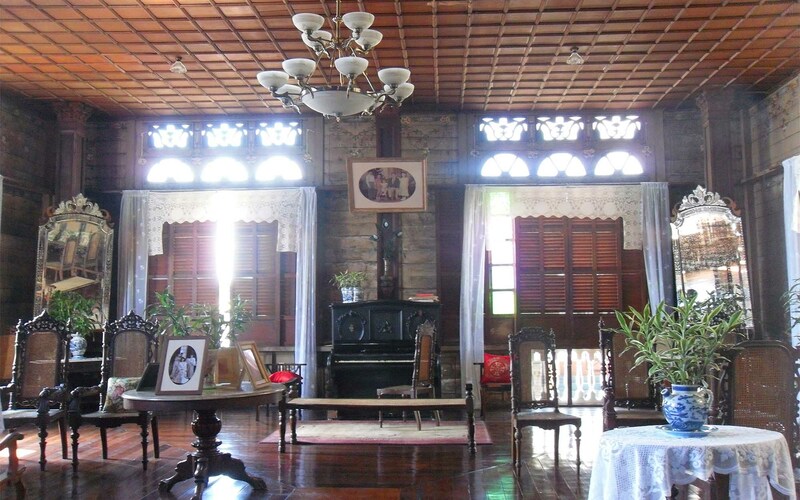 Compared to the Art Deco Gala-Rodriguez Mansion and the Beaux Arts Natalio Enriquez Castle, this ancestral house maintains a Spanish-colonial bahay-na-bato style. Built in 1922, carpenters and artisans from Pampanga and Batangas used the best hardwood in constructing this massive house. To get to Lucban, Quezon, from Metro Manila, take a bus bound for Lucena City from the passenger terminals at Araneta Center in Cubao, EDSA-Kamuning, or EDSA-Pasay. At the Lucena Grand Terminal, hail a Lucban jeepney or mini-bus, and begin your Quezon tour from there.